How were your weekends? Mine was great!!! I finished up some decorating, the kitchen - I absolutely love the way that little room feels!! I'll share pictures this week! And enjoyed a rainy day indoors on Sunday, relaxing and enjoying time kicking back. Hey lovely! Weekend was good, but we got a little rain as well which wasn't too bad since it was nice to relax a bit in the afternoons while watching the rain. Dude your brother is going to be styling! Great picks! Thanks!!! Easy pieces I know a 20 year old could manage to put on and not be sweats! ;) I've got to find a sister-in-law! HA! My mom would kill me! loving those pleats + leopard print! can't wait to see pics of your kitchen! 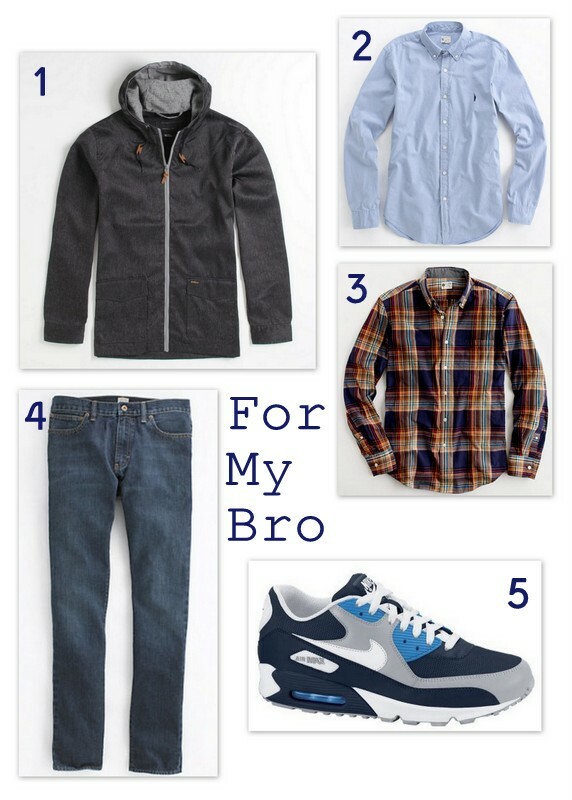 great choices.... for college guys, i suggest levi's raw denim jeans (last forever! ), a nice pair of chinos in camel and in slate, an arsenal of basic button-downs, and a few chunky sweaters, if you are up north or in the mountains! Love those sneaks! Fall catalogs have been dominating m e too!